Believe it or not, shoes play a huge role in making your backpacking trip the best or worst adventure of your life. Even walking a single mile in the wrong shoes could put you in terrible pain for the rest of your trip. So finding the best shoes for backpacking Europe is the key to comfort on a long journey. Since there is so much to keep track of during a backpacking trip, you shouldn’t have to second-guess shoe choices too. When finding the best shoes for backpacking Europe, there are many different aspects you need to consider. We’re here to give you all the best guidance and help you find the perfect balance between comfort, style, and function. When you’re planning any trip, there are going to be a million things you need to take into consideration. Unfortunately, there are a few details that can be hard to nail down. The weather and the state of the terrain can be incredibly unpredictable. Always remember to hope for the best and plan for the worst. The terrain is a huge factor to take into account when looking for the best shoes for backpacking Europe. Some people hike most of their trip, and others prefer to keep it within the city limits. However, it is more common that you need to factor in a pretty solid mix of the two. I would recommend planning for both just in case. Being spontaneous is half the fun on a backpacking trip, so you need to be prepared for anything. When looking for hiking shoes, you need to focus on getting good traction in any weather. When walking in the city on the unforgiving pavement, you need extra comfort and a touch of style. Finding the best shoes for backpacking Europe involves studying a variety. There are not any shoes that will do the trick across the board. That is why I gave you a wide selection of options. Even if none of these shoes are right for you, it will hopefully give you some ideas. There is a huge reason you will want to consider hiking shoes rather than hiking boots. It’s a simple fact that they are lightweight and easy to pack. So if you will be alternating between urban and rural settings, then shoes are much more practical and will save much-needed space. Comfortable shoes are essential to an enjoyable backpacking trip. There are quite a few things you can do to optimize comfort during your travels. I have a few tips for you. Otherwise, you could make comfortable shoes unbearable. The right shoes paired with the right socks are a match made in heaven. If it is summer, you will need thin, breathable socks that still protect you from rubbing on long hikes. You will need to match your socks to the appropriate weather and their length to your shoes. If you decide to wear boots, you will have to wear long socks to avoid rubbing. I recommend checking out this informational site if you would like to know more tips on finding the right socks. You are going to need to consider your natural arch. If you have a high arch, you will probably need to get the appropriate insoles for support. Most hiking shoes have an arch, but it may not be enough for you. Get used to insoles if you usually wear flat shoes. I always used to wear Converse, so anything with an arch was very uncomfortable at first. That is something you should do long before your trip begins. Not only will you need to get used to your shoes, but they will need to get used to you. Breaking them in is essential before you start a trip. It is widely recommended to break in shoes way ahead of time. There is no telling how long it will take because it depends on the shoes. Give yourself ample time to test them out and make sure they are comfortable enough for your journey. It is very common that the best shoes for backpacking Europe can vary from person to person. You need to find the right shoes specifically for you. As I mentioned before, there are a plethora of different styles to choose between. The list I have compiled is merely a taste of the best options. But wI narrowed it down to a selection of the best hiking shoes, walking shoes, and sandals. They were chosen based on the fact that they will be the most useful year round, but especially during peak backpacking season. So you can expect a wide variety of styles and prices. When picking the best hiking shoes, you need to think about comfort and functionality. Mesh will give you breathability, and a cushioned sole will offer support. You will also want to choose shoes that fit your feet the best. They need to provide enough stability during your hike. Merrell is a massive name in hiking shoes. According to many customers, if you buy any Merrell’s, you will be in hiking heaven. Keeping that in mind, I made sure to pick two styles that have high ratings for men and women. First off, we have the Moab 2 vent hiking shoe for men. It is ideal for summer hiking because it is a combination of suede leather and mesh. That will provide you with proper breathability while hiking long distances. The closed-cell foam tongue and the protective rubber toecap will help keep moisture and debris out. Merrell also includes an air cushion insole will absorb shock and add stability. You can find the Moab 2 for about $ to $$. The women’s Siren Edge hikers are athletically styled. These shoes are made for comfort and excellent traction. The bellows tongue and seamless overlap will help keep out debris in a similar fashion to the men’s Moab 2. You can find the Siren Edge Hikers for about $ to $. Both of these Merell shoes have an excellent customer rating of 4.5 out of 5.0 stars. The men’s Adidas Terrex AX2R is made in the USA. They have excellent arch support, superb traction, and durability that is perfect for all-terrain hiking. A combination of textile and mesh materials make them incredibly lightweight. The shock-absorbing air cushioned heel will add maximum comfort during long hikes. 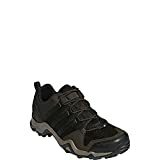 You can find the Adidas Terrex AX2R’s for about $ to $. You are also getting a fantastic rating of 4.5 out of 5.0 stars. A day on the trail isn't complete without the adidas Terrex AX2R hiking shoe underfoot. Protective toe rand. Heel pull tab. Padded tongue and collar. Comfortable fabric lining offers a great in-shoe feel. Molded foam insole. adiPRENE in the midsole absorbs impacting shock. TRAXION outsole delivers reliable grip over mixed terrain. Imported. Measurements: Weight: 14 oz Product measurements were taken using size 11.5, width D - Medium. Please note that measurements may vary by size. Weight of footwear is based on a single item, not a pair. The women’s Salomon X-mission 3W trail running shoe is a fabulous option for maximum comfort on the trail. Designed with a rubber sole, extra cushioning, and sensifit technology. If you are worried about feeling the terrain through your shoes, these are an excellent option. These Salomon’s will cancel out the uncomfortable feeling of sharp rocks under your feet. The Salomon X-mission shoes cost about $ to $$. They also have a solid rating of 4.5 out of 5.0 stars. When living your best city life, you need to be comfortable. There are so many things to do and see. So you will be on the go for a majority of your stay. When finding the best shoes for backpacking Europe, you need walking shoes that will give you comfort and style. When you’re looking for comfort and style, the Ecco Soft 7 Sneakers will give you a taste of both. That is why I chose them as a versatile choice for both men and women. Made with soft leather and suede, there are also endless color options to fit any style across the board. The only thing about these shoes is the fact that many customers are split on the quality of the support they offer. They are the type of shoe you should try out for your personal comfort before your trip. Ecco Soft 7 Sneakers run a little differently in price for men and women. The men’s options cost about $ to $$ with a rating of 4.3 out of 5.0 stars. The women’s styles go for about $ to $$ with a rating of 4.4 out of 5.0 stars. Short boots are a huge trend right now. For that reason, I had to include the Sorel Emelie Chelsea boots. They are one of the best shoes for backpacking Europe because they offer everything you need in function, style, and comfort. Not only are they incredibly cute but they also have a seam-sealed waterproof construction. So in the typically wet streets of the United Kingdom, they will give you better-suited protection. The Sorel Emelie boots come at about $$ to $$ with a rating of 4.5 out of 5.0 stars. The ladies aren’t the only ones who need a touch of style. The Born Nigel boots come in five different color options. The distressed suede or full-grain leather gives them a beautiful worn appearance for a casual but classy style. A microfiber lining, a thin sole, and a wide fit make them incredibly comfortable. All around, it will give you optimal comfort in any city setting. You can find the Born Nigel boots for about $$ to $$ with a solid rating of 4.0 out of 5.0 stars. Sandals aren’t going to be on everyone’s list. But maybe they should be. If you plan on spending any time on the beach or the coast in general, you will need the perfect shoes. You might end up wanting to wear the right sandals for most of your trip. I’m personally familiar with Birkenstock sandals because they are my mom’s favorite shoes of all time. She would recommend them as the best shoes for backpacking Europe. Even in the winter she throws on socks and keeps wearing them, so that says a lot. These shoes have leather straps and a synthetic sole. They offer arch support and have a deep heel cup. When wearing Birkenstocks, you need to remember that they require a lot of wear time to break them in correctly. They don’t usually start as the most comfortable sandals. However, once they are perfectly broken-in, they will mold themselves to fit your feet and last a lifetime. Birkenstocks Arizona unisex leather sandals go for anywhere from $ to $$ depending on which color you choose. It might seem like a wide range, but they also come in over 60 color options. These shoes got a great rating of 4.3 out of 5.0 stars. OluKai sandals are trendy for beachwear. The Upena gladiator sandal is a women’s style. They have a comfortable microfiber lining, rubber sole, and leather straps. There are also straps for your toes. But you will need to walk in them ahead of time to find out if they’re comfortable for you. Some women don’t even notice the straps. But other women had a remarkably different experience and found them to be unbearable. 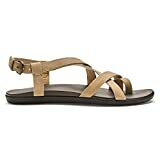 These OluKai sandals got an overall rating of 4.3 out of 5.0 stars, and you can find them for about $ to $. The OluKai Waimea leather sandals for men come as a flip-flop style. They have a hand embroidered footbed and microfiber lining for extra comfort. These OluKai sandals should also be worn ahead of time because they will mold to your feet. So they get even more comfortable over time. You can find the OluKai Waimea leather sandals for about $$ to $$, with a fantastic rating of 4.7 out of 5.0 stars. Add tread to trend with the stylish and comfortable OluKai Upena sandal! Adjustable ankle strap with antiqued metal buckle for a customized fit. Non-marking rubber outsole with textured pods for enhanced traction and durability. Synthetic rubber outsole will not leave marks or scuffs on surfaces of any type. Imported. Measurements: Weight: 7 oz Product measurements were taken using size 8, width B - Medium. Please note that measurements may vary by size. Weight of footwear is based on a single item, not a pair. Finding the best shoes for backpacking Europe depends on personal style and comfort. You will need to take a lot into account when making your choice. So I hope my tips listed in the beginning will be of some assistance in your decision. Many people recommend boots for backpacking. I moved away from hiking boots because you will probably want more footwear options while traveling in Europe. Lugging around hiking boots when you aren’t wearing them is extra weight and bulk that you don’t need. You need to know what terrain you will face. Cheaping out is the last thing you want to do here. Comfort, durability, and a variety of options is crucial. Choose more than one pair of shoes for your journey, even if you don’t pick anything we have mentioned. If you have any recommendations for the best shoes for backpacking Europe, we would love to hear about it in the comment section below.